Ludhiana, June 13, 2018 (Rajinder Ahuja): Summer can be wonderful time for you and your dog to spend time outdoors exercising and having fun. However, it is important to understand that hot temperatures can be very dangerous and you must keep your dog cool. These views were expressed by Dr Kirti Dua, Incharge Wildlife centre of Guru Angad Dev Veterinary And Animal Sciences University, Ludhiana. He said that the most common warm weather hazards are heat stroke and dehydration. Any dog exercising on a hot, humid day, even with plenty of water, can become overheated. One of the common situations of dogs becoming sick is because they are left in car in hot summer days. Even if the weather outside is not extremely hot, the inside of the car acts like an oven - temperatures can rise to dangerously high levels in a matter of minutes, even with partially opened windows. The dog's normal body temperature is 100.5 to 102.5 degrees Fahrenheit. When a dog is exposed to high temperatures, heat stroke or heat exhaustion can result. When humans overheat we are able to sweat in order to cool down. However, your dog cannot sweat as easily; he must rely on panting to cool down. Dogs breathe in through the nose and out through the mouth, directing the air over the mucous membranes of the tongue, throat and trachea to facilitate cooling by evaporation of fluid. The dog also dissipates heat by dilation of the blood vessels in the surface of the skin in the face, ears and feet. If temperature of Dog rises to 105 or 106 degrees, the dog is at risk for developing heat exhaustion. It damage to the body's cellular system and organs may become irreversible. Once the signs of heat stroke are detected, there is precious little time before serious damage - or even death - can occur. Heat stroke is a very serious condition that requires immediate medical attention. He suggested some remedies that never leave your dog alone in the car .Avoid vigorous exercise on warm days. When outside, opt for shady areas. Keep fresh cool water available in a shady place at all times. Certain types of dogs are more sensitive to heat. Use extreme caution when these dogs are exposed to heat. 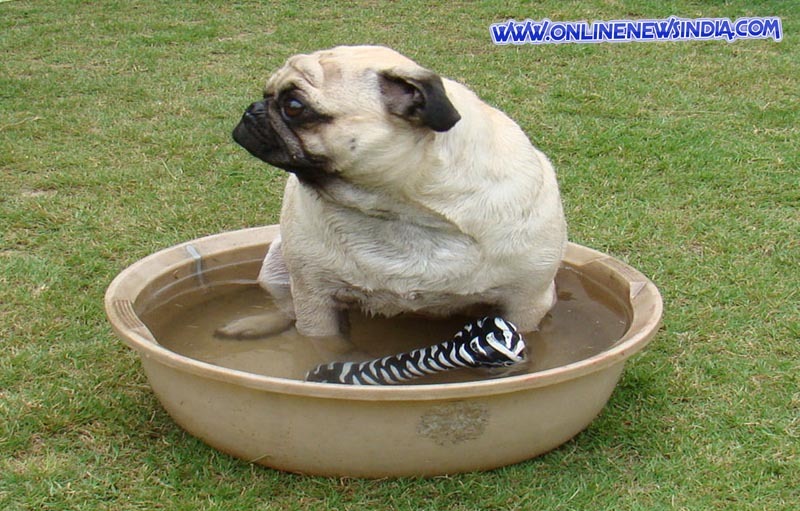 Many dogs enjoy playing and lounging in the cool water. Providing them with tub or kiddie pool or running a sprinkler can be a good option. Dr Dua said that keep an eye on your dog always.